Hamburgers and Hot Dogs are simple, but only a few are really outstanding. Here is a list of my favorites from around the South. The Baron’s Tea House is a surprisingly sophisticated little tea house in the little town on the way to the beach. Dustin and I spent our teen years in Crestview, and we go back every year to visit family in the summer. I tried to go to the Tea House last year, but went in without a reservation and was sent packing. Even though I saw plenty of tables available. This is one criticism I’ve heard about this place, that the staff may not be as welcoming as you’d hoped and that they act like they just don’t need your business if you don’t follow the rules very closely…and there are quite a lot of rules. Make your way through them, it is worth it. This year, I wised up and got my reservation when I rolled into town. Even when I called to change the number of diners, they were very gracious. If you’ll notice on the menu it says that you have to reserve certain “teas” (like the Teddy Bear teas for the kids). I thought that was what I was doing, but apparently you have to reserve that particular menu item. So, if you have kids (or if you think that tea would appeal to you!) give the menu a glance and make a plan. The house itself is in a little quaint strip mall, nestled between a donut shop and a dog groomer. The interior is filled with dining room tables (like in your house, not sterile like from a restaurant supplier) and a wall of tea cups. You each get to pick your own tea cup, which I thought to be a nice touch. The walls are decorated with paintings and hats, but you’ll have to bring your own hat to wear if you wish. They are no longer available for you to wear, which I think is an excellent idea. I have no desire to share a hat with strangers. Since we both ordered one, the goodies were piled on one tray which we sat between us. It was perfect, a little taste of everything. The tea sandwiches on the bottom were watercress and tomato and there was also a chicken salad sandwich which was out of this world wonderful. It was seasoned perfectly and did not have any nuts or fruits to gunk it up. That was my favorite choice on the tray, I believe. 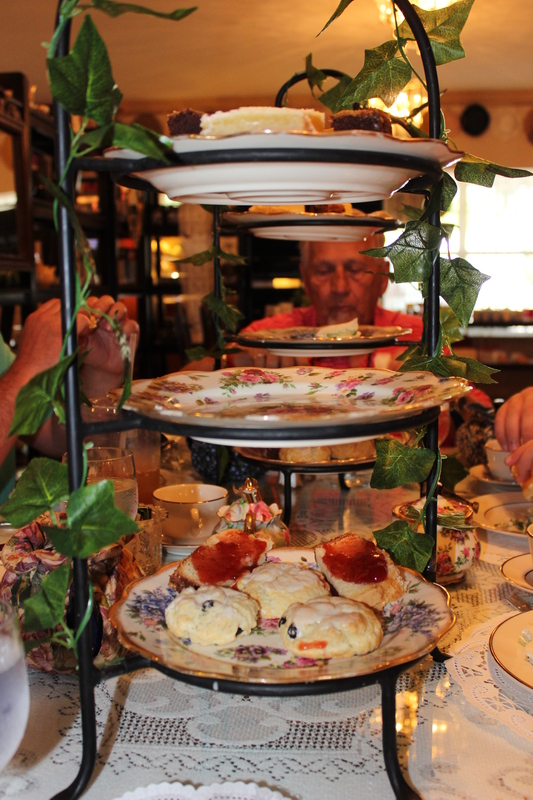 The top was covered with tiny cakes, scones and cannoli which were all tiny and perfect. 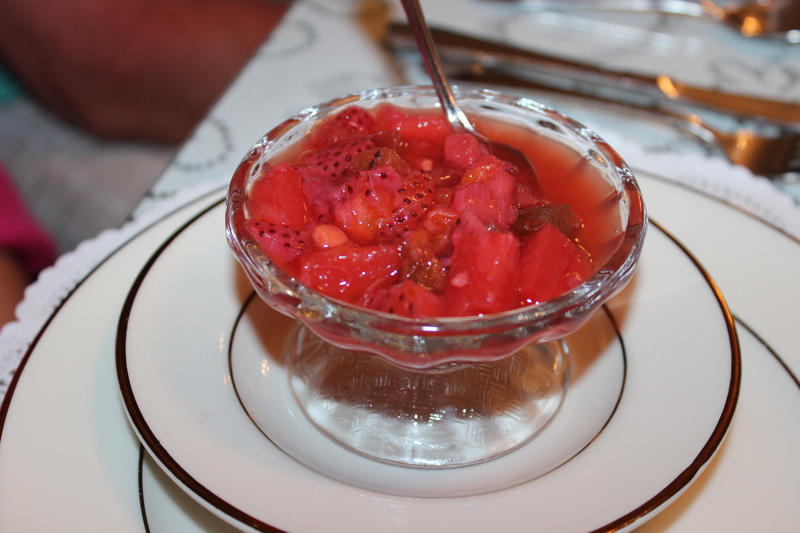 The bottom featured their famous almond butter tea bread covered with strawberry preserves. As a lover of all things almond, I would happily eat those little gems for the rest of my life. The dessert plate! 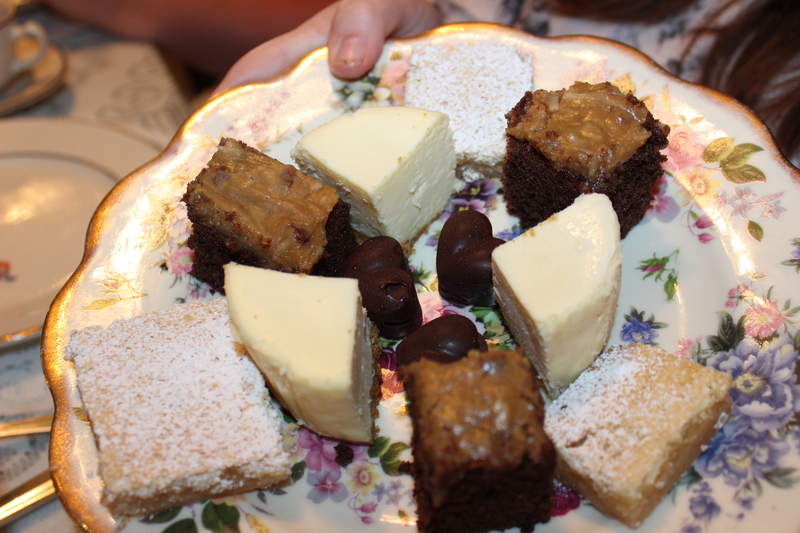 Cheesecake, German Chocolate Cake, Lemon Bars and Chocolates with Caramel inside. 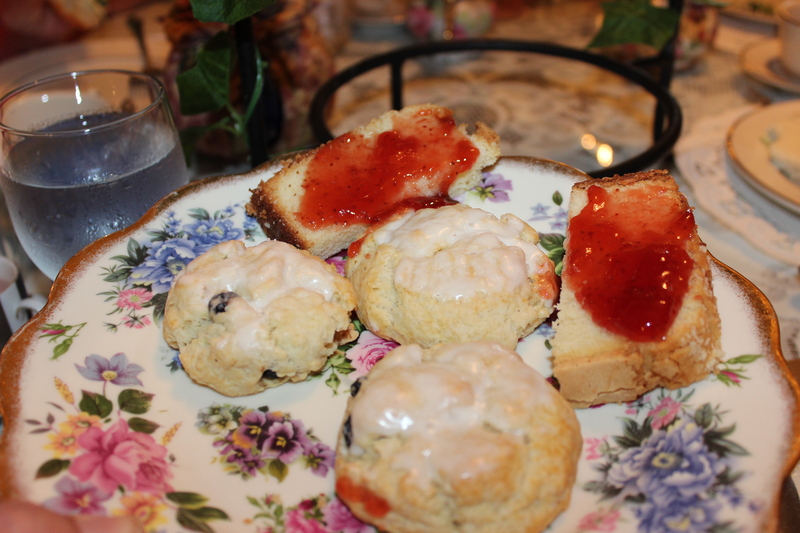 Scones and Almond bread smeared with strawberry jam. 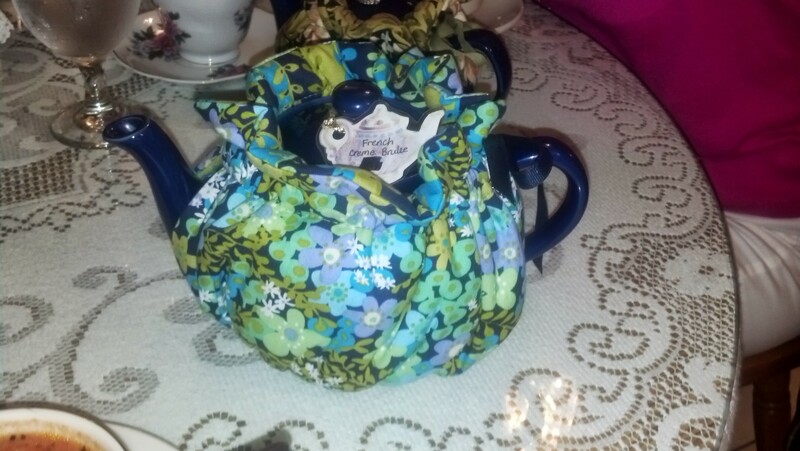 The tea was served in an adorable tea pot with a cozy around it to keep it warm throughout the meal. The flavor I chose was the French Creme Brulee and it was so good. Even though it was summer, we chose to get it hot, but you can get any of their teas iced as well. Next time I may try that, but I needed the full experience this time. My tea was mild and had a yummy caramel taste. 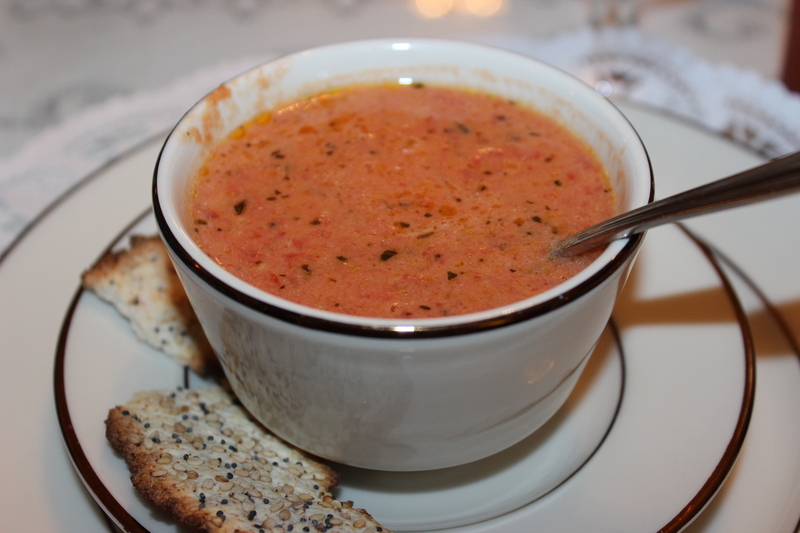 Much to my delight, the soup of the day for us was a Tuscan Tomato. It was so amazing! Creamy and sweet with roasted tomatoes and just the right amount of basil to add a fresh counterbalance. Served with a fancy cracked black pepper cracker for a bit of crunch. I would come back to enjoy the soup by itself! The quiche of the day was a bacon cheese quiche and instead of slices, we each got our own personal quiche. These left a little something to be desired, as they were very dry. I think it might be a better idea to go ahead and bake the whole pie and serve slices like the menu indicates. 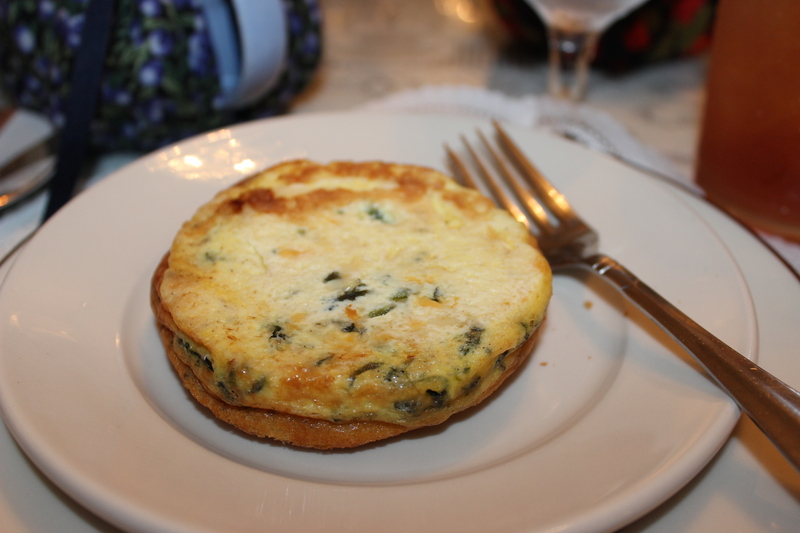 Update: When we visited this summer, the quiche was cooked better and was very tasty. I loved the salad! 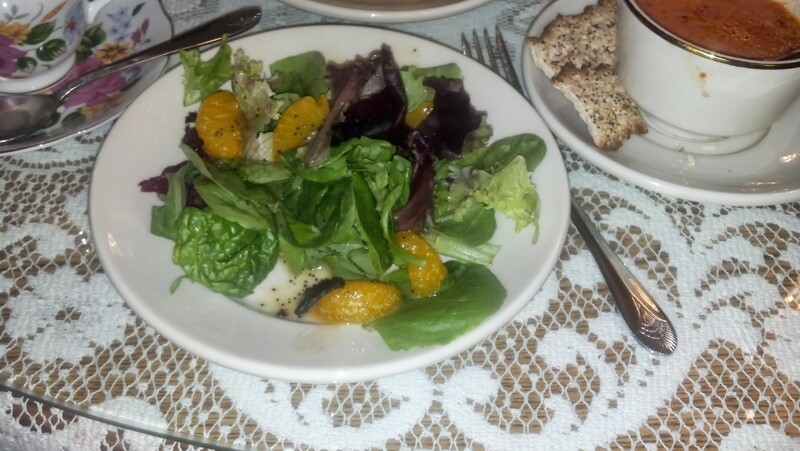 It was light and the slices of mandarin oranges coupled with the sweet house dressing made it so refreshing. I loved the mixed greens as well. Crisp and delicious! 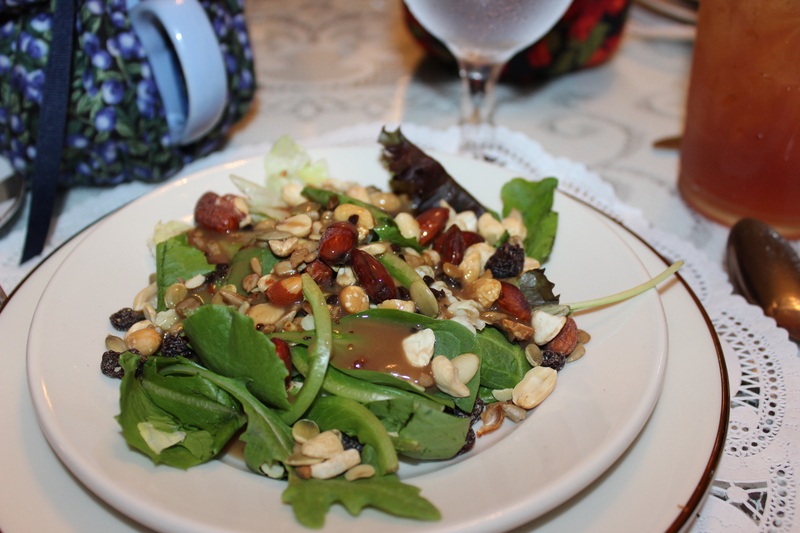 The next time I visited, I got a different salad, chock full of nuts and dressed with a sweet vinaigrette. It was good, but my other diners ordered the salad with Ranch dressing: and it came out premade and in a little container. Yuck! My daughter got the “Kitten Kaboodle Tea” as a second choice to the Teddy Bear Tea I failed to reserve. It really wasn’t enough for her (she’s 10) but there was plenty of ours to give her (in spite of the dire warnings not to share food) to fill in the gaps. The Kitten Kaboodle tea comes with a pot of hot chocolate (or tea if preferred). It was pretty watery for her, so not a great success. Also included is your choice of a blueberry scone or the almond butter bread and she chose the scone which was flaky, warm and sweet. Perfect with the clotted cream! Also included is your choice of tea sandwiches (PB&J, ham & cheese or cucumber) which Mary Ashley chose the ham and cheese. It was a basic sandwich with the crusts cut off. Perfect for kids! Also included are kettle chips, and my crew insisted they were house made. If not, they were the most delicious potato chips we’d ever had. 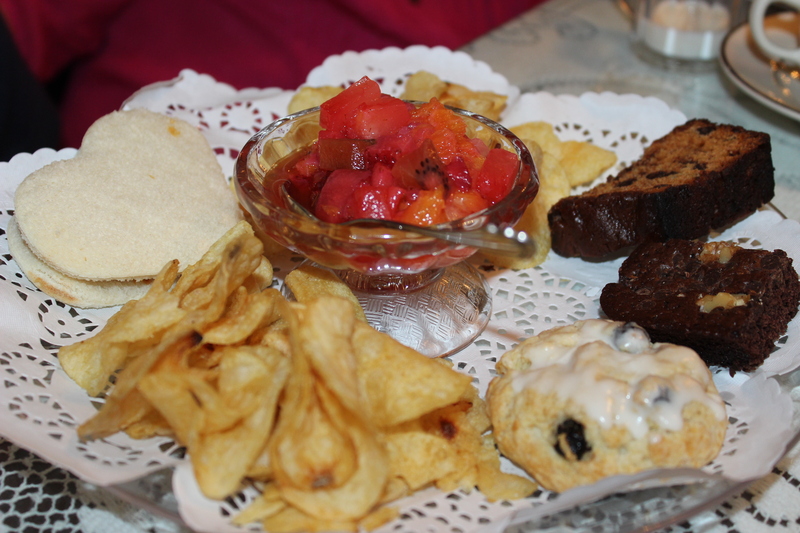 Brownie and Amish bread are both on the side (so good and sweet!) and a fruit salad called Caramel Apple accompanied, which is a kids dream come true: apples drizzled with caramel and tossed with marshmallows. Insanely good. We can’t wait to go back next summer! This time, I’ll reserve the exact tea the kids want. Update! We visited again this summer and I have a few updated pictures. So so so good!